This evening I made grain-free Chicken Noodle Soup for dinner. We actually had a cold front move in after the torrential rain and storms we had yesterday. It was chilly today for a change (well, chilly for Atlanta weather...LOL). 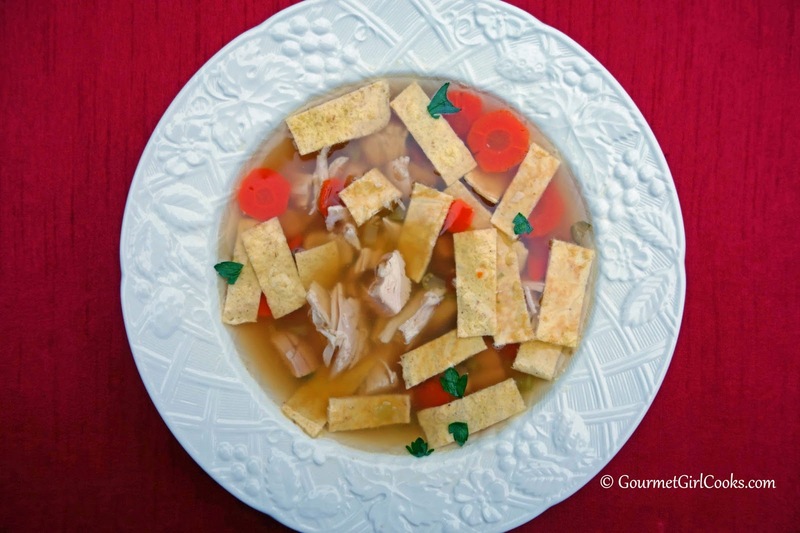 I used homemade chicken stock for my soup that I made in the crock pot a couple days ago using a couple chicken carcasses from the chicken we had for dinner Sunday night or you could use ready made like Pacific Foods brand. I filled my 6-quart crock pot almost to the top and slow cooked the leftover chicken and carcasses for about 24 hours (overnight and all day long) and then strained and refrigerated it. When I got home from work this evening, I placed the pot of chicken stock on the stove and brought it to a boil and cooked it down a bit to concentrate it while I sliced and diced my celery and carrots. I added them to the pot and cooked until tender. While my soup was simmering, I made 4 grain-free tortillas to cut up and make noodles with. I usually like to cut them into thin noodles, but this evening I made wide noodles instead. They are so quick and easy to make and only take about 5 minutes or so to actually cook. The soup was delicious and perfect for our chilly evening. Hubby and I really enjoyed it. I look forward to having some for lunch tomorrow. 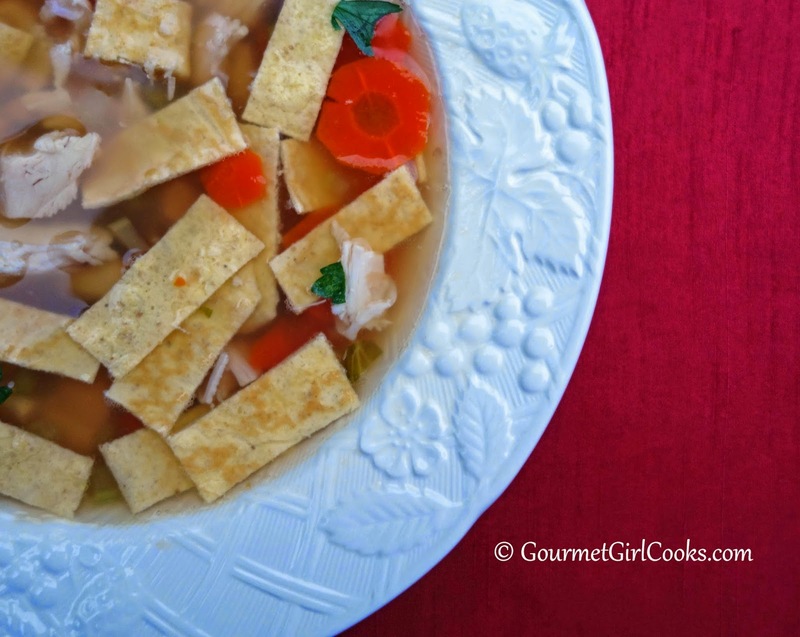 I love using my grain-free tortillas as noodles in this soup. I snapped a few photos as well as included the easy peasy recipe below. 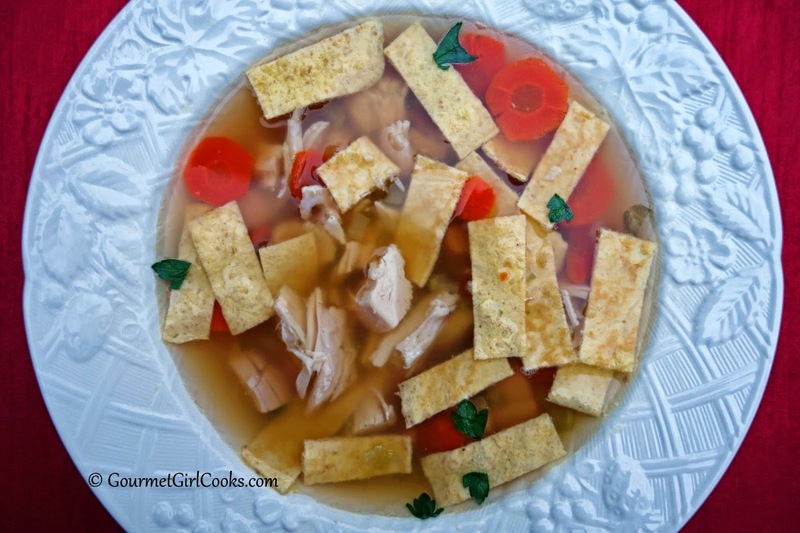 If you miss homemade chicken noodle soup, you will love this recipe. Enjoy! To make the tortilla/noodles, whisk all ingredients together in a small bowl to form a smooth, thin batter (makes approximately 3/4 cup batter). Lightly spray a 10-inch non-stick skillet with olive oil spray and heat over medium-high heat. Pour a few tablespoons batter into hot skillet, tilting the pan and using a circular motion to evenly distribute the batter in the bottom to make an approximate 8-inch tortilla/noodle. Cook approximately 1 to 2 minutes, until very lightly browned and cooked around edges. Carefully loosen and flip using a rubber spatula; cook for about another minute. Transfer to a plate and repeat for remaining noodle/tortillas (lightly re-spraying pan for each). Makes approximately four 8-inch tortillas. Cut into desired noodle sized strips. In a large stock pot, bring chicken stock, celery and carrots to a boil; reduce heat to a simmer and cook until vegetables are tender, about 15 minutes. Add parsley and chicken; season with salt and pepper to taste. Simmer for an additional 10 to 15 minutes. Add noodles and heat about 5 minutes. How do the noodles hold up in leftovers? Do you need to hold off putting them in until reheating?